Weda Reef & Rainforest Resort was, in 2015, selected by Scuba Diver Australasia as one of the top sixteen Eco Resorts of their region. Ninety percent of the employees are people from Halmahera. Solar water heaters, providing hot showers in the resort. Ultra low emission outboard engines for the dive boats. Solar power and batteries, that provide much of our 24-hour electricity. Wind turbine for top-up electricity. Making drinking water with filters and UV technology. 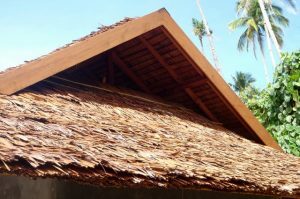 The roofs were made from dried pinnated Sago palm leafs, plaited by the local people. The walls were made from dried sago palm ribs (gaba-gaba). Together with the tiled floors the bungalows offer a perfect blend of traditional techniques and modern comfort. The houses are cool, even during hot tropical afternoons. For your comfort we also installed ceiling fans, for some extra breeze. For more images of our traditional eco bungalows, have a look at the Bungalow Gallery here. 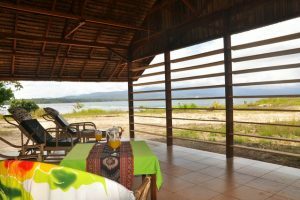 Our Sawai Ekowisata foundation goals are conservation and education. Our programs: purchasing and protecting primary forest (900 hectares now), planting mangroves, managing a Sea turtle conservation project, we built and are running a Kindergarten (85 children) and English classes in the village. Further we have been building public toilets and providing fresh water to the villagers of Sawai Itepo. We hope to be able to play a bigger role in marine conservation in near future. We work together with our good and important neighbor The Aketajawe National Park (Taman Nasional Aketajawe-Lolobata ). 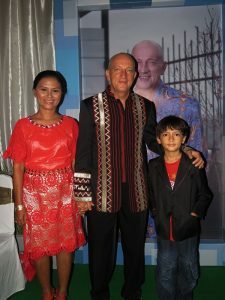 In 2015 Weda’s founder Rob Sinke was a guest at the famous Indonesian talk show “Kick Andy” to talk about his and Linda’s efforts for the environment and social situation on Halmahera. Two years earlier, Rob received the prestigious “Pahlawan untuk Indonesia” Award out of the hands of the Indonesian Minister for Environment Protection. In 2009 Rob received the Kalpataru Award for Nature Conservation from the Governor of North Sulawesi for his conservation work on North Sulawesi. You can read more about this on our vision on Eco tourism page on the Divers Lodge Lembeh website.